Naked Bacon does not use harmful nitrites during the curing process which have been linked to bowel cancer. Nitrates used to cure the meats are to blame, according to experts at Johns Hopkins University School of Medicine. The Daily Mail has shortlisted Naked Bacon as one of the best healthy bacon products on the market. Let me introduce the new Bacon Crusader. He doesn’t have a cape, but Denis Lynn, founder of Northern Ireland’s Finnebrogue, is definitely a man on a mission. 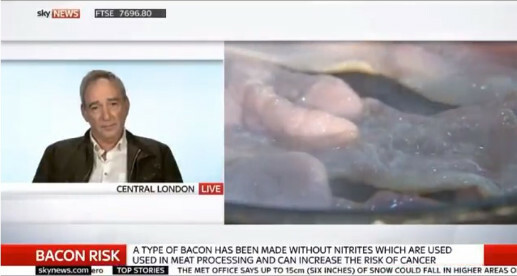 Watch Finnebrogue’s chairman, Denis Lynn, discuss Naked Bacon on Sky News. Watch Naked Bacon being tasted by the presenting team on ITV’s Good Morning Britain. 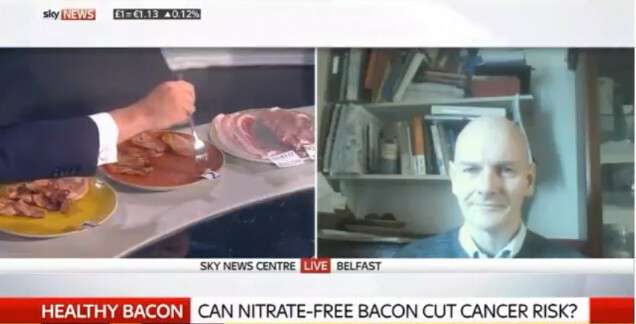 Watch Naked Bacon being tasted live on Sky News, with comment from Professor Chris Elliott, Chair of the Institute For Global Food Security at Queen’s University Belfast. Listen to Finnebrogue’s chairman, Denis Lynn, discuss the ‘absolutely gorgeous’ Naked Bacon on TalkRadio. Food experts have welcomed a major breakthrough in the British fry-up after scientists developed a new technique to reduce the risk of bacon giving you cancer.